In terms of the hardware, one of the only completely new features on the iPhone 4 is the gyroscope. It’s so new, in fact, that third-party developers haven’t had a chance to play around with it yet because they didn’t have access to the iPhone 4 hardware until today (or at least two days ago). And because they didn’t have the hardware, that means there are a sad lack of apps that use the feature so far. But actually, there is one out there. Ngmoco’s Eliminate: GunRange. And it’s awesome. The game itself is simple. You pick a gun (preferably a high-powered semi-automatic one) and head to the shooting range. But the game shines thanks to the gyroscope — which is required for you to play. 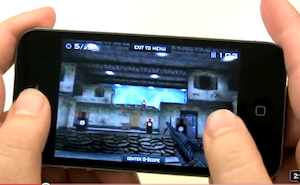 Rather than dragging your finger around the screen to tell your gun where to aim, you simply tilt the iPhone itself. Sure, you could sort of do this previously with the compass built in to the iPhone 3GS — but trust me, this is much, much better. With you fingers freed up from aiming, they can do other things here — such a shoot. That’s how you fire your weapon, simply tap the screen. You can imagine that as more developers take advantage of this gyroscope, they’ll come up with plenty of innovative things you can do on the screen during games since your fingers are now freed up. Watch the video below to see just how accurate and sensitive the gyroscope is. Again, it’s pretty amazing. Last week, we highlighted a company, Subversus Interactive, that created a technology to emulate a gyroscope without actually having one (which again, no iPhones before the latest one do). That’s impressive as well, but using the actual gyroscope is much more accurate (and that developer has said he’s excited to try it out to make his system more accurate). I’m going to go ahead and assume ngmoco got an iPhone 4 early to build this thing. As soon as other developers have had this device for a while, there are going to be some amazing games as a result. Below my video, check out the one ngmoco made themselves — yes, they’re much better at the game than I am. You can find Eliminate: GunRange in the App Store here for $0.99. If you were lucky enough to get an iPhone 4 today, you should definitely check it out.